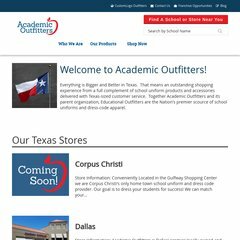 academicoutfitters.com Traditional Private School Uniforms and Public School Uniforms .. The programming language environment is ASP.NET. Its 2 nameservers are ns20.ixwebhosting.com, and ns19.ixwebhosting.com. It is hosted by Tw Telecom Holdings Inc (Colorado, Littleton,) using Microsoft-IIS/7 web server. PING www. (64.129.66.54) 56(84) bytes of data.